Over the years, we've amassed an extensive collection of Lonny Breaux reference tracks and Frank Ocean rarities. In doing so, we've had plenty of help through existing collections of Frank Ocean songs. These tapes, which include The Lonny Breaux Collection and unreleased, MISC., laid the foundation for what undocumented, RARE. would become. Still, there was more out there. Much more. After years of digging through blogs and scouring Internet archives (as well as the hard drives of some fellow stans), we've brought together the rest of Lonny/Frank's pre-Blonde discography and made it available to download in one place. undocumented, RARE. is a Frank Ocean Stan's best resource for unreleased tracks not included in The Lonny Breaux Collection. The tape was compiled with everything else featuring Lonny Breaux or Frank Ocean (and in one case, Kellen The Criminal) in the years spanning 2010 to 2015 including a few features and remixes that you can't purchase anywhere. The best audio has been sourced for each track and each have been tagged with the year they were released online, if not recorded. The collection was created as a companion to The Lonny Breaux Collection. As such, this tape may contain some light overlap with that one depending on the version you downloaded. As more reference tracks have leaked over the years, varying versions have appeared with enough differences to allow some duplication here. So long as you have both, be confident that you’ve got everything that been available online as of the release date for this version. The release has 42 tracks that include reference tracks, snippets, remixes, and all of the tracks Frank released on his Tumblr account. Each track has clean metadata including lyrics. Alternate album art is included in the folder. Chances are, if you're a stan like us you may already have many of these tracks. If so, you may want to check this release for better quality bitrates of the songs you have. There have been zero edits made to the encoding of these songs so that you can be sure you have the best versions available on the Internet. This is intentional. We just recently upgraded a few ourselves after listening to crappy youtube rips for years. If you can prove us wrong, we'd be happy to upgrade the tape with your improvements. Reach out to us here. 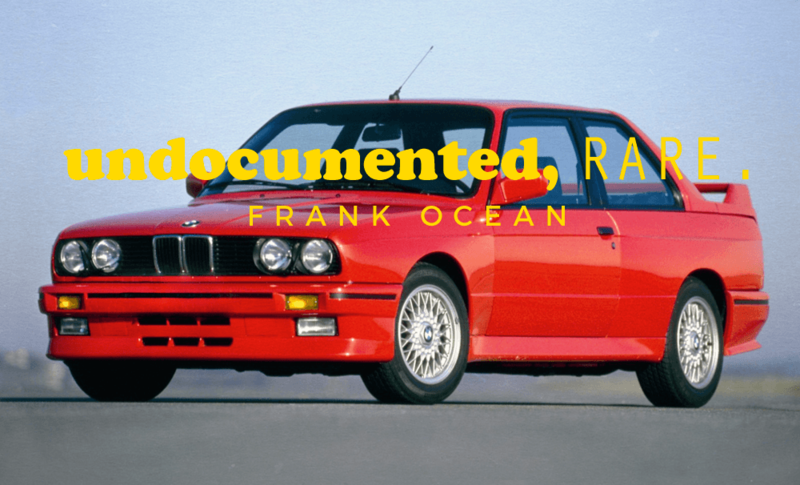 For those that are Frank Ocean fans, but looking to dig deeper. We hope that undocumented, RARE. as well as The Lonny Breaux Collection will save you some time and open you up to the fascinating world of songwriter extraordinaire Lonny Breaux. Omitted are several popular rarities that we can't verify as Frank's. Namely, these are "Anywhere" and "Girlfriend's Best Friend." Before you get at our inbox, yes we've heard the unpitched versions of both. They're fine tracks, but—as close as they may sound—We just can't fully buy into either of them as Frank's tunes. We've linked to these in the master list under a section listing other known fake Frank songs, but pending legitimate confirmation (as if...), they will not be included in the tape for this reason. If you notice that this release is missing anything, please let us know. We'd be glad to hear that we missed something or that you've found something new. While we're on the topic, don't skip out on the master list. There are some great Frank Ocean related downloads there that any Stan would want to add to their collection including skits and clips from blonded RADIO, the instrumentals that streamed in the days leading up to Endless, and even an old livestream recording with Lonny and Ciara. If you're wondering where most of these tracks are coming from, we'll let Franky tell it. We hope you enjoy this tape as much as we do. There was a fair amount of time spent putting it together, so if you're feeling it, follow us on Twitter. This tape was originally compiled curbside.audio. It has been reposted and maintained here with permission. Initial 40 track release on curbside.audio. Moved documentation to blonded.blog (you are here). Added two versions of "Reach For The Stars." The original, unfinished one by Rockie Fresh, the other a finalized Remix by Midi Mafia and Tronixx.